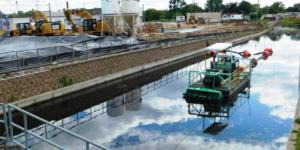 The Cedar Creek OU2A environmental dredging project was conducted to clean up PCBs-contaminated marine sediments from Cedar Creek, in Cedarburg, Wisconsin. 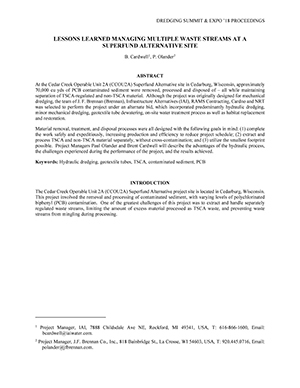 IAI was a member of a team of contractors, who were selected to perform this Remedial Action project, after submitting an alternate proposal for high production hydraulic dredging to geotextile tubes for the majority of the sediment. IAI’s scope of work included geotextile tube dewatering of the dredged sediments, and water treatment. The first phase of work (2016) involved mechanical dredging of approximately 5,500 cubic yards of PCBs-impacted sediment from Ruck Pond. For this portion, IAI utilized our Mobile Water Treatment System to treat elutriate produced by mechanical dredging operations. The Mobile Water Treatment System provides 100 gpm of treatment capacity, and is a complete treatment facility, with equalization, clarification, filtration and activated carbon treatment processes, contained in two 52-long enclosed trailers. During the larger, second phase of work, performed in 2017 and 2018, approximately 68,000 cubic yards of PCBs-contaminated sediments were hydraulically dredged from Columbia and Wire and Nail Ponds, dewatered in geotextile tubes, and removed from the site for final disposal. The dredge slurry was pumped to the landside sediment processing area, where the IAI crew utilized geotextile tubes to separate the water from the solids in the dredge slurry. The dredged material was conditioned with a polymer to help flocculate the solids. The polymer was selected by IAI after bench testing was performed on samples of Columbia Pond sediment. IAI submitted the Additive Approval application to Wisconsin DNR (WDNR) for the polymer, and other chemicals utilized in the water treatment plant, receiving approval prior to the start of hydraulic dredging. 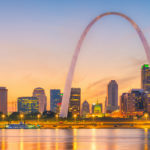 There were varying levels of PCBs in the sediments targeted for removal, including a lesser volume of sediment that met the threshold for regulation under the Toxic Substances and Control Act (TSCA). TSCA-regulated sediments were required to be disposed of in a Resource Conservation and Recovery Act (RCRA) Subtitle C landfill, while the majority of the sediments could be disposed of in a different landfill facility, at lower cost. 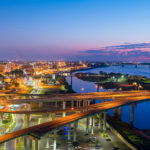 In order to accomplish separate disposal, however, the dredged material had to be removed and dewatered in two separate waste streams: TSCA-regulated and non-TSCA. This became a complicated process as the TSCA and non-TSCA sediments were layered over one another in the ponds and had to be segregated from removal and through processing, all while maintaining project efficiency and production goals. IAI and the dredging contractor worked hand-in-hand to develop specialized procedures that successfully prevented cross-contamination of the TSCA-regulated and non-TSCA sediments. Geotextile tubes were filled and stacked over two separate dewatering pads, one for TSCA material and one for non-TSCA. IAI crews processed up to 3,000 gpm of dredged material flow during dredging operations, sometimes receiving all dredge flow at the non-TSCA dewatering pad, and at other times, receiving flow at both pads, simultaneously. Filtrate from the geotextile tubes was collected in a sump, then treated in the water treatment plant. The treatment plant was designed, installed and operated by IAI, and incorporated clarification and settling, pressure filtration and activated carbon adsorption processes. Up to 3,900 gpm of water was treated in the water treatment plant during dredging operations. 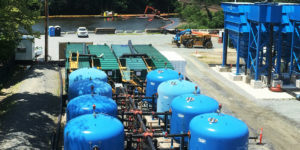 A Wisconsin-certified wastewater treatment operator, employed by IAI, served as the Operator of Record for the system. The treatment system maintained an excellent record of compliance with all WPDES permit equivalency effluent limitations, including the non-detectable PCBs limit and monthly average 5 mg/L TSS limit. The dewatering pads and water treatment plant were placed in a very small area inside a neighborhood park. 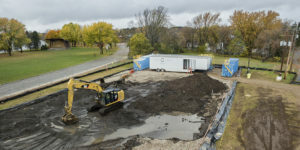 It was incumbent upon the Project Owner, and their contractor team, to complete the remediation work safely, quietly and quickly, so that the park could be returned to the community. One solution offered by IAI was to stack the geotextile tubes inside a limited footprint, to minimize disturbance of the park, while still processing all of the dredged material. IAI’s Project Manager for the Cedar Creek site, Brent Cardwell, has co-authored a technical paper about the project, which was published in the conference proceedings of the 2018 WEDA Dredging Summit. Click here to read the paper, by Brent Cardwell and Paul Olander: Managing Multiple Waste Streams at a Superfund Alternative Site.